Metrino is a tool to support the validation and quality assurance of models and can be used as an independently or in combination with ModelBus® service. 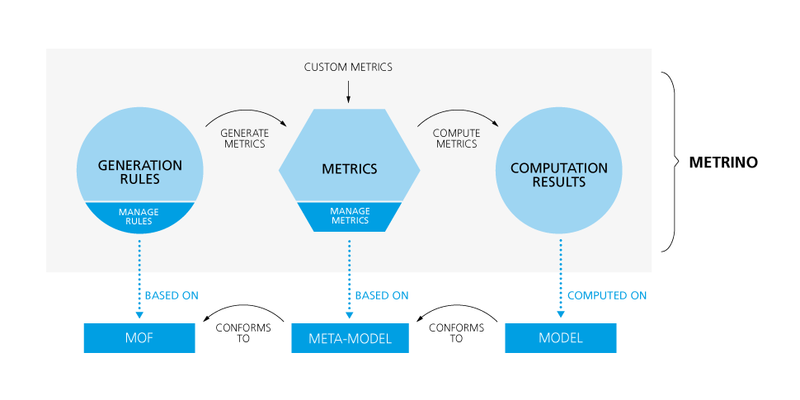 It is able to manage and generate the metrics for domain specific models and allows you to automatically derive metrics from a meta model based on an extensible set of rules or to define custom metrics for it. The metrics can be applied to any model, which conforms to the metamodel they have been generated for. Metrino analyzes and verifies the attributes of the artifacts including complexity, size and description. Furthermore the tool offers different capabilities to present and visualize the metric’s computational results, e.g. in tabular way and kiviat diagram. These results can be analyzed over time, since the tool stores results of multiple evaluations. The overall goal of Metrino is to improve each individual artifact as well as the complete system information and to assure the quality of the final software-based system.